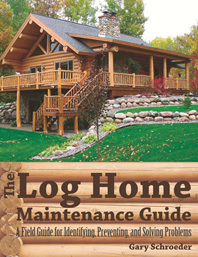 America has hundreds of thousands of log homes, and every one of them presents unique maintenance issues that differ from homes of traditional stick-frame construction. Lack of knowledge about the unique characteristics of a log home all too often results in owners inadvertently doing damage when they try to make repairs. Owners of log homes have long relied on the expertise of log home builder and specialist Gary Schroeder and his Schroeder Log Home Supply company, a trusted source of information and guidance. From dry rot to carpenter ants, Schroeder has seen it all. Now he shares his wisdom on how to preserve and protect your beautiful log home. This newly revised edition takes advantage of all the recent techniques and products—it’s a state-of-the-art guide to identifying, diagnosing, and solving problems so you’ll enjoy many trouble-free years in your log home. Gary Schroeder, a former forester and consultant, has also been a custom log home builder and restoration contractor. He and his wife, Kathy, started Schroeder Log Home Supply, Inc., now a leader in the field, in 1986.